ABERDEEN PROVING GROUND, Md. --- The U.S. Army Research Laboratory is experimenting with a hybrid unmanned aerial vehicle that transforms in flight and gives Soldiers an advantage on the battlefield of the future. 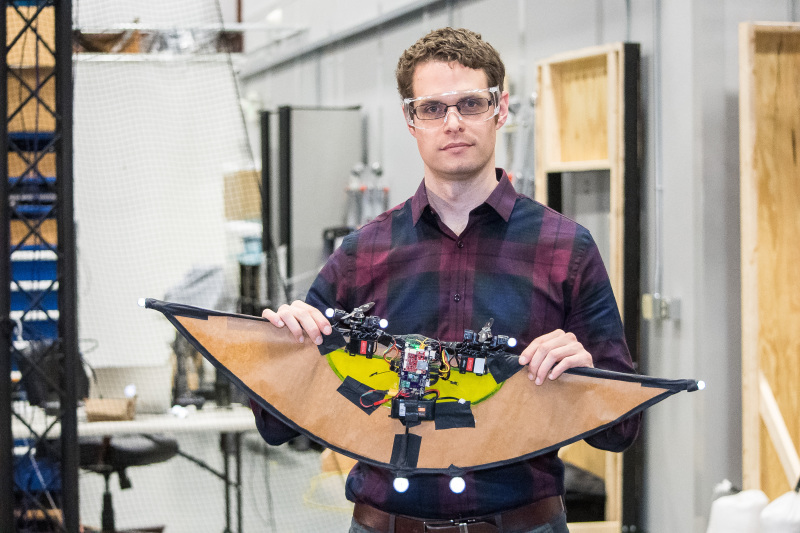 Weighing in at just over half a pound, this UAV tilts its rotors to go from hovering like a helicopter to speeding along like a sleek airplane. The design has many efficiencies, but also provides many challenges to its creator, Dr. Steve Nogar, a postdoctoral researcher with the lab's Vehicle Technology Directorate. "In an aircraft, weight is everything," Nogar said. There are a lot of vehicles out there where designers take a quad-rotor and staple it to a fixed-wing aircraft. It may have extra propellers and actuators and it's not very efficient. You have a lot of wasted weight." "The tilt-rotor design that is kind of like the V-22 Osprey, where the motors tilt themselves," Nogar said. The Osprey is a multi-mission, tilt-rotor military aircraft designed for both vertical takeoff and landing. The V-22 is more than 57 feet in length. Shrinking that capability to less than one foot has been a challenge due to the complex physics that govern the vehicle's movement and the associated control methods, Nogar said. "Looking forward, we want to look at perching or landing on something in the environment," Nogar said. "That means we have to be able to sense the environment." "If you're going to land on something, you need to know very quickly how fast that's coming up to you as you come in to land," he said. "We will need to enable the UAV to sense and perceive its environment using visual techniques such as machine learning." Building robots involves mastering design concepts, repair of the hardware during testing and a lot of software programming. Nogar said he has spent much of his time coding. "I was kind of surprised, but in retrospect it makes sense," he said. "A robot is a computer and you have to program a computer. Programing is a basic tool of the roboticist." The next step is continuing to experiment, refine and experiment more. "These vehicles will better integrate with Soldiers," he said. "Soldiers are going to have to be able to interact with these vehicles all the time and they're going to have to work as a team to achieve their objectives." That objective may be finding out what's over the next hill, or scouting out enemy forces. "We cannot put a lot of sensors on this vehicle," Nogar said. "It's basically what we can do with just one camera. It takes a lot more work to do the control and study the dynamics of this vehicle, but it we will definitely benefit from the effort once it's finished."